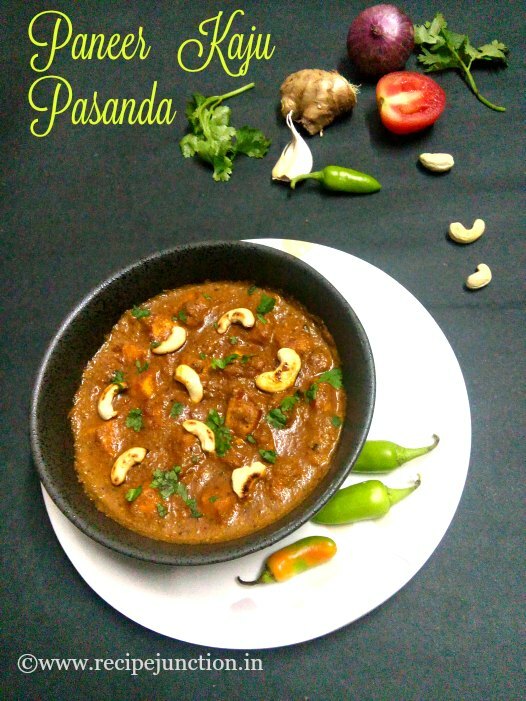 Pasanda is a popular North Indian and Pakistani dish, derived from a dish served in the court of Mughal Emperors. The Word "pasanda" in Urdu/Hindi means "favorite", traditionally made with lean meat of Lamb. But nowadays this dish is made using Chicken, Prawn and also with Paneer in restaurants. It is basically a creamy and mildly spiced gravy made with pureed onion, tomato and cashewnut paste. I wanted to try pasanda recipe for long. 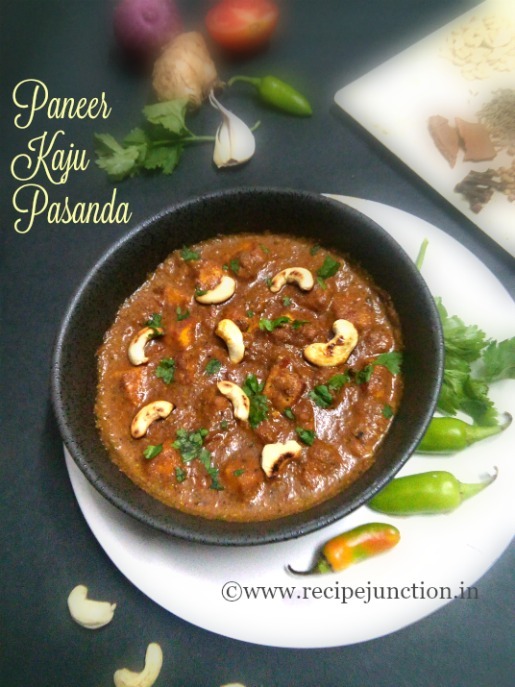 This Pasanda recipe I found on Chef Sanjeev Kapoor's website which is made using paneer. As it was my first try, I also went ahead with paneer. I found it a really interesting dish which has creamy gravy made with onion, tomato and cashewnut along with some roasted spices. Paneer Cubes : 300 gms. Poppy seeds/khuskhus : 1 tblsp. Grated Coconut : 2 tblsp. Sunflower or Melon seeds : 1 tblsp. Heat sufficient oil in a kadai and saute the cottage cheese/paneer cubes till light golden. Drain onto an absorbent paper and set aside. Also fry cashewnuts in the same oil till light golden. 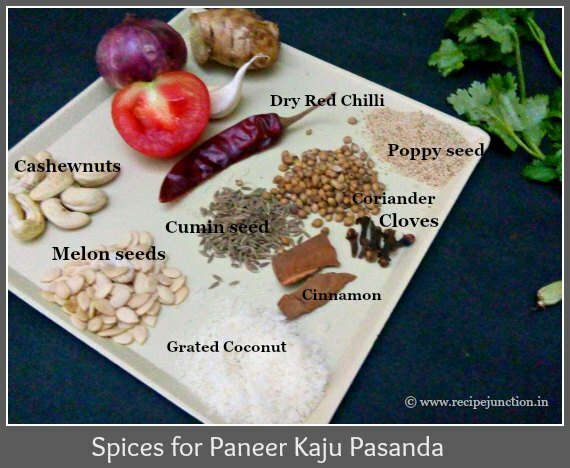 On a hot tawa/pan, dry roast red chillies along with poppy seeds, coconut, cumin seeds, coriander seeds, sunflower seeds, cloves and cinnamon. Now in a wet-grinder, take chopped onion, fried cashewnuts and all the roasted spices and grind to a paste using a little water. Also puree 3 tomatoes separately. Heat 2 tblsp. oil in a pan, add the ground paste and fry for 4-5 minutes till you get a nice aroma or oil leaves the masala. Add tomato puree, sugar, salt and half cup of water. Add the fried cottage cheese and cook further on low heat till gravy thickens. Remove from heat. Enjoy this creamy Paneer dish with Pulao or any kind of Indian Bread like paratha, Naan or Roti.